The AFC Divisional playoff matchup on January 4, 1998 featured two AFC West rivals, the visiting Denver Broncos, a 12-4 wild card entrant, and the host Kansas City Chiefs, the top-seeded club in the conference at 13-3. The Broncos, under Head Coach Mike Shanahan, were built around 37-year-old veteran QB John Elway and RB Terrell Davis (pictured above), the AFC’s top rusher with 1750 yards. Shannon Sharpe was a highly-productive receiver from the tight end position and unheralded wide receivers Rod Smith and Ed McCaffrey benefited from his presence. Key defensive players included DE Neil Smith, who was picked for the Pro Bowl; LB John Mobley, who received All-Pro recognition; and seasoned veterans LB Bill Romanowski, CB Ray Crockett, and FS Steve Atwater. Kansas City, coached by Marty Schottenheimer for the ninth year, was in the postseason for the seventh time during that period but had yet to make it to the Super Bowl. QB Elvis Grbac suffered a broken collarbone during the season but was back for the playoff game. 37-year-old RB Marcus Allen may have been past his prime, but he was still outstanding in short yardage situations, as attested to by his 11 rushing touchdowns. 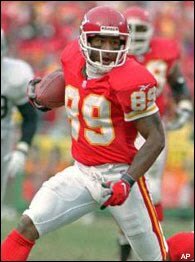 WR Andre Rison had revived his career in Kansas City, earning a Pro Bowl slot with 72 catches for 1092 yards. On defense, both of the starting cornerbacks, Dale Carter and James Hasty, were Pro Bowlers and the linebacker corps led by Derrick Thomas was outstanding. The Broncos easily dispatched Jacksonville by a score of 42-17 in the Wild Card playoff round while Kansas City had a bye week. There were 76,965 in attendance at Arrowhead Stadium on an overcast day. The first quarter was scoreless as the Broncos had two long possessions into Kansas City territory that resulted in punts and the Chiefs went three-and-out in between and had the ball on a series that extended into the second quarter and made it to the Denver 47 before also resulting in a punt. The Broncos again kicked and Tom Rouen’s second punt (following a penalty) went just 25 yards and gave Kansas City good field position at the Denver 30. But Pete Stoyanovich’s successful 34-yard field goal attempt was taken away by a ten-yard holding penalty, and his second try from 44 yards was no good when it bounced off the crossbar. The Broncos proceeded to drive 65 yards in eight plays highlighted by Elway completions of 26 yards to TE Dwayne Carswell and 17 yards to Rod Smith on a third-and-seven play to the Kansas City four yard line. 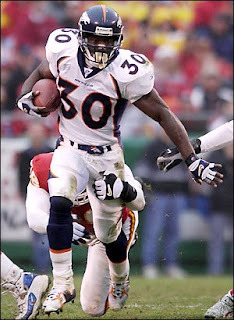 Just after the two-minute warning, Terrell Davis ran one yard for a touchdown and Denver took a 7-0 lead into halftime (it was the first rushing TD the Chiefs defense had allowed at home since the 1996 regular season, a string of 42 quarters). The Chiefs received the second half kickoff and drove 67 yards in 11 plays. Grbac started off with a completion to Rison for 34 yards and there were two third-down conversions along the way. Two runs by Grbac got the ball down to the six and on third-and-goal from the three, a pass into the end zone was pulled down by rookie TE Tony Gonzalez, but he was unable to keep both feet inbounds. Stoyanovich kicked a 20-yard field goal to narrow the score to 7-3. It appeared that the Broncos would add to their lead when, on the third play following the ensuing kickoff, Davis took off on a 41-yard run to the KC 11. However, RB Derek Loville fumbled two plays later and safety Reggie Tongue recovered for the Chiefs. The teams traded punts before Grbac threw to WR Joe Horn for a 50-yard gain to the Denver 15. A 12-yard scoring pass to Gonzalez put Kansas City in front by 10-7 going into the fourth quarter. The Broncos wasted little time regaining the lead as, early in the final period, Elway connected with McCaffrey for a 43-yard completion to the Kansas City one. From there, and after being stopped twice for no gain, Davis scored his second short TD of the day. With Jason Elam’s successful point after, Denver led by four. There were still over twelve minutes remaining in the game and the Chiefs responded with Grbac throwing to Rison for a 23-yard gain and Marcus Allen carrying for 14 to the Denver 35. The drive stalled and, on fourth-and-six they lined up for 48-yard field goal attempt. However, it was a fake as holder Louie Aguiar took off and ran, but he was stopped by CB Darrien Gordon after picking up only three yards. The teams traded punts, neither able to sustain a drive until Kansas City got the ball back at its 17 yard line with just over four minutes remaining. A 29-yard pass interference penalty on the Broncos moved the ball to the KC 46, but a 10-yard call for tripping on the Chiefs took it back to the 36. An 11-yard completion to Gonzalez gained some of the yardage back, but after two incomplete passes, it was fourth-and-nine. Grbac kept the drive – and his team’s hopes – alive with a pass to WR Lake Dawson that gained 12 yards. DE Alfred Williams sacked Grbac for a 10-yard loss, but a completion to Rison was good for 23 yards and another first down at the Denver 28. With no timeouts left, Grbac completed three passes that totaled eight yards. A fourth-and-two throw intended for Dawson in the end zone was deflected by Gordon and fell incomplete. That was the last gasp for the Chiefs as Denver held on for the 14-10 win. Kansas City had the edge both in total yards (303 to 272) and first downs (18 to 16). The Chiefs suffered no turnovers while Denver gave up the ball twice on fumbles. However, Grbac was sacked four times (as opposed to Elway being dumped once). Untimely penalties (one of which took three points off the board), the failure on the fake field goal, and, ultimately, the inability to reach paydirt on the final drive made a difference in the closely-fought contest. Terrell Davis rushed for 101 yards on 25 carries and had the two short touchdowns. John Elway completed just 10 of 19 passes for 170 yards with no TDs but also none intercepted. Ed McCaffrey led the team’s receivers with 3 catches for 56 yards. For the Chiefs, Elvis Grbac was successful on 24 of 37 throws for 260 yards and a touchdown, also with none intercepted; he also ran the ball four times for 22 yards. While nine different receivers caught passes, Andre Rison (pictured below) stood out with his 8 for 110 yards. Marcus Allen, in the last game of his Hall of Fame career, ran for 37 yards on 12 carries. The Broncos went on to defeat Pittsburgh in the AFC Championship game and the Green Bay Packers in the Super Bowl. It was the first win for an AFC club at that level since the 1983 season and was the first of two straight for Denver. Kansas City collapsed to 7-9 in 1998, marking the end of Schottenheimer’s coaching tenure, and did not reappear in the postseason until 2003.